Allison Schiff described the problem on AdExchanger.com, reporting on a recent talk that Lee Peterson, EVP of brand strategy and design at WD Partners, gave at a big retailer show in New York. In-store visits have fallen at least 5% every month for the past 30 months. Holiday foot traffic was down 8.5% in 2014 – but overall holiday sales were up 4%. Holiday foot traffic in 2013 was down 50% compared with 2010, while Internet sales have increased every quarter by at least 15% for the last two years. She quoted Peterson: “Stores as we knew them are over.” He laid much of the blame on mobile devices and millennials, who don’t seem to care much about visiting stores. What’s happening, of course, is that ever-easier online shopping is disrupting stores, much the way online reading is disrupting newspapers. This isn’t new news, but the size of the drop in store visits over the last two years is sobering. Faster, more convenient mobile phones with bigger screens are accelerating the trend. Shoppers, especially younger ones, are finding no need to drive to a physical location and mingle with other humans (and other inventory) to get many of the items they want. At first look, this is a frightening development for those of us in the local media business. Local retailers are our life blood. They use advertising to drive store traffic, and their spending is the backbone of our media business model. If they’re going in the dumper, so are we. At second look, however, it’s an opportunity. It’s a classic disruption scenario. Twenty years ago, consumers had to go to stores for just about everything. Local stores achieved a lot of their sales just by being there — being in the local market, being open and having some things people would want to buy. Today they’re in competition with millions of stores on the Web that are open 24/7, offering vastly more choices, often at lower prices. It’s getting worse, as mobile phones put all the non-local digital competitors in hand — closer than local stores — whenever a consumer thinks about a purchase. Free second-day delivery, and next-day or even same-day in some markets, are narrowing the gap still further. So, as Peterson says, stores need to get better. What does that mean? It means making the in-store experience more fun, more informative, more fulfilling. It means providing experiences in the store that websites can’t equal. And, at the same time, it means making the in-store experience quicker, more convenient and less frustrating. That’s a tall order for a lot of local retailers. People who are used to putting inventory on racks and shelves are not necessarily well prepared to create a great shopping experience and promote it. That’s where I see local media entering the picture. We need to realize this trend puts us under the same pressure as local retailers. We need to raise our game. It’s no longer enough to provide just ads and ad distribution — we need to help retailers by bringing them great ideas to pull shoppers into their stores. There’s no shortage of possibilities: in-store events, contests, giveaways, seminars, celebrity visits, trunk shows, loyalty programs and more. The list goes on and on: Enter “how to increase store traffic” in your favorite search engine, and you’ll see a huge number of ideas. We can develop complete packages to help retailers make promotions happen, and we can flood the market with awareness of these events. We may even want to co-brand some of these with them. If we do these things, we will benefit ourselves just as much as we do them. 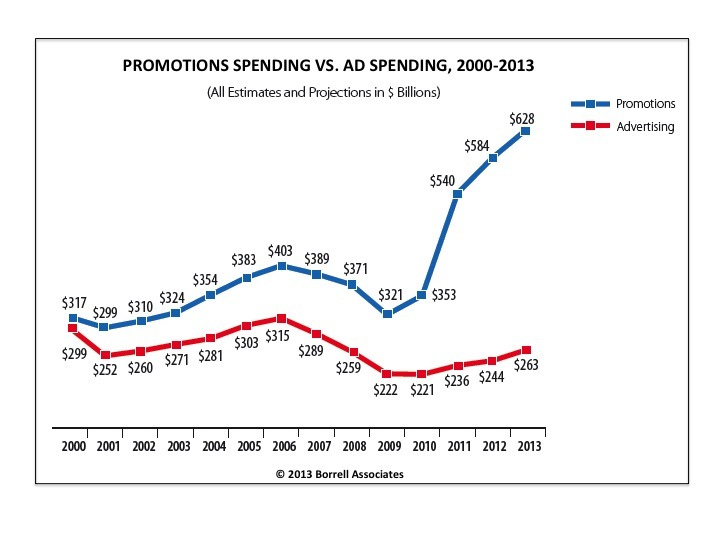 There’s a lot of money there, as Borrell Associates pointed out in a 2013 report showing the dramatic rise in promotion spending by businesses in local markets. Whatever the promotion is, it needs the right media package to put it on the radar for local shoppers. This calls for smart use of social media, email, targeted online display, search-engine marketing, mobile-friendly landing pages and the rest of the digital bag of tricks. And, of course, print. It’s time for traditional media organizations — newspapers, TV stations, radio stations — to recognize that their future can be a whole lot brighter if they learn to play the game of local promotion. I blogged recently about a couple of cases where newspaper companies did that, in a number of forms. But we can take it much further than those examples. To do this, local media will need to hire someone with a sharp retail promotional skill set and then start taking great ideas to local retailers. It’s our job to help retailers succeed, and this is what it takes in 2015. Our local retailers are in a fight to survive, and we need to fight right alongside them. Posted on January 27, 2015, in Advertising, Audience, Digital media sales, Disruption, Media business model, media management, Mobile, Revenue, Sales and tagged in-store traffic, promotions. Bookmark the permalink. 4 Comments.